The Secret Garden Meeting used to be known as Under The Tree. This is a place for hope, healing, acceptance, support, and most importantly a place to be free and safe. Please join us! How do you see or imagine your baby/ies now that you do not have them with you? I know that Carleigh is in Heaven and she is happy. She'll never have to experience pain or sorrow. She'll only know true joy in the Lord. She has a life that is far better than mine, and I would want nothing less for my special girl. I like to think that she can see me and that she is happy that I'm her mommy. I imagine that Carleigh looks a lot like her sister Kyndra but with subtle differences. I'm pretty sure she would've been a blonde-haired little princess. How did the loss of your last pregnancy affect your choices/decisions about the birth of your subsequent pregnancy? I haven't experienced a sub pregnancy yet. We are currently TTC so perhaps soon. I know I will be nervous whenever I do get pregnant as I fear the loss of another child. I know that I can trust God to get me through both good times and difficult times. I also wanted to share this song with you all. It's called You're Not Shaken by Phil Stacey and I hear it on KLOVE. It's one I've been listening to a lot lately. 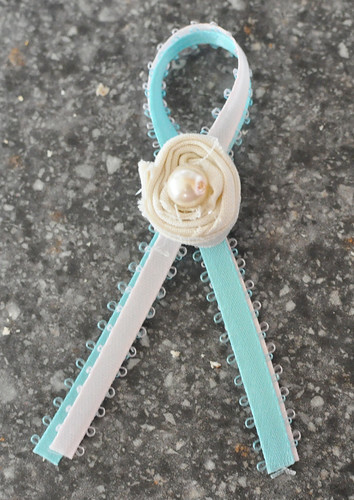 Please go to my friend Celia's blog and read about her cause. She is knitting hats in memory of her son Noah to help out other families facing the loss of their baby or with a baby that is in the NICU. She'd like some help in giving her project a name so please stop by and help her out. Both her and I would appreciate it! I decided to do another Q&A post in case someone didn't get to participate the last time. So I'm opening up for questions over the weekend and then next week I will answer them. So this is your chance if you're itching to know something about me. And because I love to give things away anybody who leaves a question will be entered in a little giveaway. Does that sound like I'm bribing you? I'm really not, I promise! I just love making someone's day a little brighter and this just gives me a good excuse. :) So just leave your question in a comment. And one more thing! Carleigh's pic that Carly took is now on the memorial site if you want to go take a look. Thanks so much Carly! This week, we are sharing the impact our loss(es) had on our marriage. Losing Carleigh is the toughest thing our marriage has faced, but it isn't the toughest thing we have endured as a couple. Losing Jordan is the toughest by far. A few months after Anthony and I started dating I found out I was pregnant. We made a poor choice and a pregnancy resulted. I won't go into all the details in this post but we made a hasty decision to end my pregnancy. Most couples that go into an abortion together do not stay together, but we did. Perhaps my denial of the situation at the time had something to do with that. I'll never know what the outcome would've been had I realized then what I had done, but I am glad we stayed together. We never really talked about Jordan until after Kyndra was born. It hit me very hard and I suffered greatly. I kept my suffering to myself mostly. 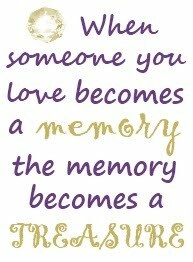 Both Anthony and my best friend Lindsey knew I was hurting but they never knew the true extent of it. The day of my greatest despair I reached out to God before I went to bed. I pleaded with Him to take it all away. God answered my prayer. The very next morning I felt like a completely different person. I felt more like me than I had in the months since Kyndra's birth. I didn't deserve it but He is so loving and forgiving. I had told God that whether He chose to heal my heart or not that I would go to counseling. I kept my promise and made the call. I don't think Anthony really understood why I wanted to go to counseling but he supported me in doing something I felt I needed to do. I shared some of my counseling with him but kept it mostly to myself. It may surprise you, but Anthony is better at talking about his feelings than I am. I don't like to talk about things. I would much rather write them. That I can do. Talking....yeah, I'm not good at it. We have definitely gotten better at communicating. Anthony's had to do quite a bit of coaxing with me though. That man deserves a cookie. He's already brought me out of my shell quite a bit since being together. I used to be very shy around people I didn't really know. Now I will actually attempt to talk to people! Anthony and I really haven't talked a lot about our grief and our feelings surrounding Carleigh. And that's probably my fault. We both know we love her very much and miss her. That goes without saying. When we first got Carleigh's diagnosis there were not a lot of words spoken. Just what was necessary. I think we were both trying to get over the shock of what we had just learned. I never gave Anthony the chance to give me his opinion on whether I should carry to term or not. I knew that I was going to carry Carleigh and nothing would stop me. Nobody, not Anthony or any doctor in the world, would've been able to convince me to terminate. I have walked the road of termination and I knew the pain it had caused me. I think that's why Anthony did not object the night we found out. He knew how much I regretted not keeping Jordan. When we went to bed the night we found out we actually held each other. We hadn't done that for awhile. (He says my head hurts his shoulder. I must have a hard head or something.) We both needed that though. We needed to be close. The rest of my pregnancy with Carleigh we really didn't talk about what was to come. We planned together but that was really the extent of it. Even though there wasn't a lot of communication of our feelings we were always there for each other. It's hard to explain but a lot of times I feel that I don't really have to verbally express what I am feeling for Anthony to get me. We didn't share a lot of our feelings but I know that we drew closer together through our journey. Anthony actually asked me about something one night (I can't remember exactly what it was) and I actually told him to go read my blog because I didn't want to talk about it. Nice, huh? He then told me that he shouldn't have to read my blog to find out things about his wife. I know, I know.....but I really hate talking! I didn't like it but I did talk to him a little about whatever it was. I've prayed that God could help me in this area. I know I need to be more open with my husband so we can have an even better relationship. I think I'm slowly making progress. Slowly being the key word. I'm just so glad that he can be patient with me! TheBlogFrog brings social features like you would find on other social networks (like Facebook) to Blogs! If you are a blog author, you can install "social widgets" on your blog that let you and your readers interact with each other. If you are a blog reader, you can participate in "blog communities" where all the readers of a blog interact with each other. This is much more fun than just commenting on what the blog author happens to post about that day. TheBlogFrog can also help you find new blogs to follow. It goes beyond the standard topic recommendations and helps you find blogs written by people you know from High School, College, Email, and more. TheBlogFrog will even look at the current blogs you follow and suggest new blogs to follow! After you sign up for TheBlogFrog, you begin connecting with blogs and blog communities. If you have a blog, TheBlogFrog will connect you with the blogs you link to on your own blog. You can start finding new blogs and participating in blog communities. If you have a blog, you can even install a whole community for your blog. After you sign up, you can enter in private profile information like High School and College. This information is not shared with others and is only used to connect you with other bloggers from your life. If you haven't noticed already, TheBlogFrog has launched a new site and will be introducing some more social widgets soon! So stop by TheBlogFrog and check it all out! The widget that I have is the community widget located on the lower right sidebar. Goodsearch is a search engine powered by Yahoo but they also help charities. For every search you do using them they will donate 1 cent to the charity of your choice. Sufficient Grace Ministries is now part of this. I've already downloaded their toolbar and using them like crazy to do all my searches. I hope you'll use them too to help raise money for Sufficient Grace or some other worthy organization. Thank you to everyone who expressed interest in writing Carleigh's name. That would be so wonderful! If you do end up taking a picture, I would love to know your name, the date the picture was taken, and the location so that I can put all that information in her name scrapbook. You can email me all the info at caring4carleigh@yahoo.com. In case you are wondering, too, I am still working on her regular scrapbook. I am *almost* finished. I got quite a bit done over the weekend. My goal is to finish up this weekend and I hope that I can do that! Once I finish up my plan is to either do a slideshow or a video of the pages since many have requested to see it. I plan on doing another Q&A post and I'll be putting that up tomorrow. So if you want to know more about me and my life check in and ask a question. A big thank you to Mary Ellen for her wonderful editing on my NILMDTS photos. They are beautiful!! I love the version of Twinkle, Twinkle Little Star that you put with the slideshow. I've already shared them with some of you yesterday. (Mary Ellen put some of them on her website gallery for me to see.) You can check out her photography website Lighthouse Photography. If you're really interested in seeing the pictures just email me. Along with this, I have a praise to share. Mary Ellen had taken a break from being a NILMDTS photographer and has decided to become active again after working with my pictures. She felt God was leading her to do this. I know God is going to use her to touch many families, so thank you, Mary Ellen, for listening to His call! I also thank God for His amazing way of bringing people together for His purpose. I have some great news! My friend Stephanie has launched her new website My Very Own Angel and a new blog I Have My Very Own Angel. Please check them out and help support her! Stephanie has a tshirt on her Angel Store that I plan on getting and wearing proudly! Today it has been exactly 4 months since Carleigh was born silent into the world. What would you be doing if you were here? You'd be able to push yourself up a little when you are on your tummy. Would you like tummy time or make a fuss? You might even be able to roll over with enough practice. You'd be discovering that you can laugh and would enjoy it so much. Mommy would make silly faces at you and tickle your tummy to try and get you to make that wonderful sound. You would enjoy nursing just as much as mommy and would love being carried around in your sling. Mommy, Kyndra, and you would all take a nice bubble bath together and play in the water. You would be close to growing out of your Kissaluv cloth dipes. Mommy stalked Diaperswappers for months just to get those dipes for you to wear. Mommy would sit in the rocker and read I Love You Through and Through to you and your sister. Instead, I am just reading it to your sister. She loves reading that book. Would you look like your sister and have her personality too? Maybe as you got older people would think you were twins like they did with mommy and your Aunt Trina. You and Kyndra would probably be wearing matching outfits already. I miss all these things that never got to happen. Today, overall, has been pretty good. I put in my shift at work and picked up Kyndra from the sitter. We went and visited Carleigh since today is a special day. We enjoyed our time at the cemetery, but only stayed for about 10 minutes. The part I love is when we leave. Seems kinda odd, I know, but it's what Kyndra does when we leave that I just love. 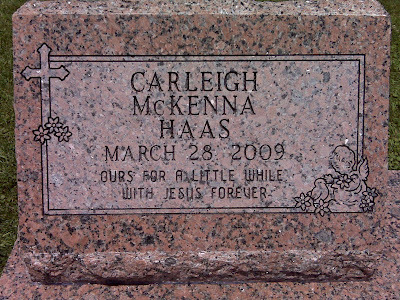 When it is time to go I tell her to give sissy a kiss and she leaves a little kiss on Carleigh's headstone. It's too precious for words. I want to thank Alison for sending me a photo of Carleigh's name in the sand in Florida. As she wrote Carleigh's name she said a prayer asking for the Lord to continue to give us peace and bless us. I just love seeing her name written. I love that someone else (other than me) was thinking of Carleigh at that moment. Thank you so much. After receiving Alison's photo, I decided to make a separate album for pictures of Carleigh's name written. So far I have her name written in Hawaii by Emily, Australia by Carly, New Jersey by Christina, and now Florida by Alison. Thank you to each one of these special ladies! Happy 4 months in Heaven, my sweet one. Lynnette begins Chapter 3 of her book by talking about the days after Samuel passed and how difficult they were. A woman's body longs for her baby, even when there is no baby to hold. There were many days after Carleigh left us that I wished that my arms could hold her just one more time. But I know that even if I was given one more time it still wouldn't be enough. When my milk came in I longed to be able to nurse my baby. Seeing other babies was difficult because they reminded me of Carleigh and all that I was missing. I wasn't sure how I would react holding a baby for the first time after Carleigh. It was 2 months later and I held my friend's baby girl at a wedding. I did ok. I thought of Carleigh, naturally, and I marveled at the little life I held. So precious and such a miracle. God's peace is certainly amazing. It's carried me through many difficult times these past 2 years. I've had moments, like Lynnette, in which I chose despair. Those weren't good moments and I found that allowing God's peace in my life allows me to function better in my "new" normal. Everybody accepts things in their own time and there's no right or wrong timeline for it. I wholeheartedly agree with Lynnette that as Christians we should grieve differently. We have hope and the promise of a life with those we have lost that will never end. Lynnette expresses that she wished she would've had an open casket for Samuel's memorial service. I had an open casket for Carleigh. However, she was never even in her casket the whole time. Instead she was in my arms. Does that still count as an open casket? I knew when we were planning months before her arrival that I wanted her casket to be open and for the same reason Lynnette wished she had-for people to have the opportunity to meet Carleigh. I wanted to share my daughter with as many people as possible. I wanted for people to see that she did exist. I still feel that way. Lynnette comments on how those around her deal with her grief. "When somebody has never lost a child or someone they love, sometimes they just don't know what to say." How true this is! I would honestly be at a loss for words if I was on the other end. I mean, what do you say? What words could possibly make it better? No words will erase the pain but it is nice knowing someone cares enough to try and help you feel better, even if they don't express it very well. I am always glad to hear people acknowledge my loss. Even if they don't get it quite right, I am grateful that they are not ignoring it. Have you ever been at a loss for words when trying to comfort another? If you've endured a loss, in what ways have people shown you they cared? How have you shown others you care? I reflected a little it on the part where Lynnette talks about her pregnant friend. Her friend said, "I don't care whether it's a girl or a boy, as long as it's healthy." I have said these exact words and just recently, too. I do feel Carleigh was such a blessing, but I would really rather not have to walk this road again. I'm pretty sure a lot of people who have experienced loss would agree with me on that. It would be very hard but God has carried me through losing Carleigh and I know He would be there to carry me again. Fear. Wow. Yeah.... There's been some of that since Carleigh left. Kyndra is out of my sight only when necessary. I feel the need to keep her close. I like having her in my arms when we leave the house, and it usually works out just fine. Church is a problem. Kyndra stays with us until after the music is done and then she goes to the nursery. Otherwise she gets a little rambunctious. When Anthony takes her to the nursery, I don't feel right. I feel empty. I feel exposed. My arms ache to hold something so I usually cling to Kyndra's blanket during the rest of the service. As soon as the service is done, I go get Kyndra. I don't like to waste time on chit chat. I need to get to my daughter. Logically, this should get better over time but sometimes I'm not so sure. Then there is the fear for our future children. I know God is in control but that doesn't stop me from worrying. I'm so scared to lose another child. Please, God, don't let me endure more heartache. But then I find myself adding at the end..... but not my will but Yours. Ultimately though, beyond my fear and worry, I trust God. What fears do you have that you feel you should give to God? I'm sure most of you in blogland know what's going on with Stellan. If not please visit MckMama's blog. We need to pray that Stellan can get through this latest round SVT. He isn't doing that well. So, wear some orange today for Stellan and link up to show your support. Kyndra is wearing her orange dipe to support Stellan. Thank you to Veronica who crocheted a hat for Carleigh to match the hat I bought for her big sister Kyndra. It was such a lovely surprise and Veronica was very generous! I received the hat earlier this week but I wanted to wait and post it so I could get some special pictures at the cemetery. Today was such a nice day so Kyndra and I went for a visit. Kyndra in her car seat before leaving our house. 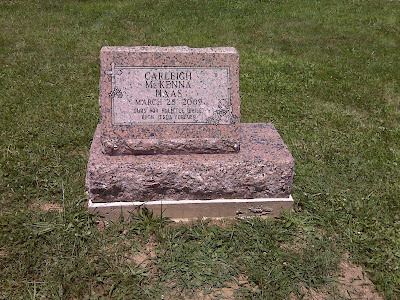 Carleigh's hat on her headstone. Kyndra giving sissy her hat. 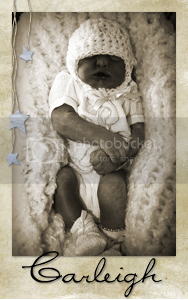 Carleigh's hat on her flowers. This 6th week, we are we are sharing our first steps into the sea of grief. My grief journey began the moment we found out Carleigh had anencephaly. Those first few days after the diagnosis were tough. We found out on a Monday and Thursday we were set to leave on our family trip to Hawaii. I took the remainder of the week off of work and my mom came down to stay with us until we left. I spent most of my time on the computer looking up things about anencephaly. I wanted to know more than what I knew about it. I read many stories of families carrying their children to term and I usually cried. I cried more during those days than I did the rest of my pregnancy or even now. Before we left for our trip I decided to temporarily forget all of our 'problems' and just enjoy our vacation. I did exactly that. We all had a wonderful time. Now I have such fond memories to look back on and know that Carleigh was with us the whole time. When we got back from the trip I started planning for the future, but with a more positive outlook. I wanted to enjoy my pregnancy instead of being constantly sad and I think I did a pretty good job at accomplishing that. I had my share of difficult moments, but God got me through them. I wasn't sad when Carleigh wasn't born alive. The days in the hospital were actually good. Leaving was the hard part. Handing Carleigh to the funeral director was the most difficult part of my journey. I really could've kept her with me forever! Her visitation and service went well and sometimes it felt odd to see other people crying more than me over my daughter. These days I don't feel sad. Lately I have been feeling more emotional but not in a bad way. When the tears fill my eyes I am usually thinking fondly of my daughter and remembering those happy times we shared together. They are tears of joy. I really miss her and I long to see her again. I will patiently wait here on earth until my time is through and then I will have forever with her and Jesus. I do have times where I miss her so much it feels like my soul is hurting. And when I have those moments, God is there to comfort me. Sometimes I feel out of place with my grief. I know that everyone grieves differently, but I don't feel I can relate to a lot of people. I can understand the grief of others only to an extent. I used to wonder if something was wrong with me. The one person that I know who gets me and my grief is Stephanee. Our grief is similar and it helps me to know I'm not alone. I'm so glad that God crossed our paths. I still haven't found the right words to describe what my grief is like and I don't think I ever will. While my life has taken on a 'new' normal, it is not far off from what my life was like before Carleigh came to us. It's just that now I have her sweet memory to cherish and the blessing of calling her my daughter. I think of her every day. I miss her every day and wish she was here. I will continue to carry what has been with me all along. Hope. 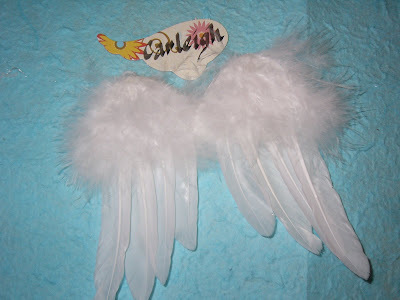 Lea made Carleigh a special pair of angel wings. I think they are just beautiful. So soft and light. 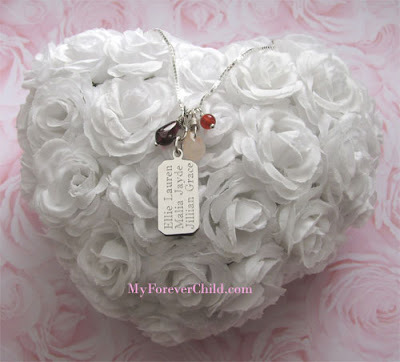 You can visit the Angel Wings Memorial Boutique by clicking here. I remember fondly Lynnette's memories of the times with her son, Jared, such as cuddling and nursing. I enjoyed those moments very much. Babies bring so much joy! I actually enjoyed changing diapers and still do! It became more enjoyable for me once I started using cloth diapers. Anthony doesn't seem to mind changing them but he likes to pass the poopy ones off to me. Aw, thanks hun. It is true, at least for me, when they say your mommy instincts will kick in. Many times I knew just what to do in regards to my baby. It's like I'd always been a mommy. I had to laugh at Lynnette's story of forgetting to put a diaper on her son. I've had my moments too! Do you have a funny experience to share? What are some of the silly or stupid things you did? I remember when Kyndra was real little and I was getting her ready for her bath. I had already taken her diaper off in the living room and thrown it away. She suddenly decided it was a good time to take a poopy. I saw what her plans were and I scooped her up and tried to get her to the bathroom as fast as I could while keep her as far from my body as possible. Needless to say that didn't quite work out like I wanted it to. There was a trail of poopy leading to the bathroom and then some on the bathroom floor including my foot. I was still nursing so you can imagine how lovely that was. At least it was easy to clean up. I learned to take her diaper off in the bathroom as close to the tub as possible just in case. Kyndra was 6 months old when we decided to start trying for another baby. I wasn't nursing anymore at this point as my supply had dwindled because of working or else I probably would've waited longer. After just a month of trying we were able to conceive. My pregnancy with Carleigh was easier than with Kyndra. I wasn't dead tired in the first trimester. I didn't have a lot of nausea either. I also had no idea that anything was wrong with my baby. When I had my first ultrasound at 7 weeks to check dates, little Carleigh was measuring 6 weeks so we adjusted my due date from April 17 to April 24. Later we found out that my April 17 due date was really correct. Her measurement was off because of her head. Has there been a time in your life that you felt the world was falling apart? When Lynnette shared about finding out about Samuel's anencephaly it took me back to my own D-Day. It's a very tough thing to be told that the child that you are carrying will not live. I imagine things had to be more difficult back then when there wasn't a lot of support around. I was so glad to read that Lynnette found a good doctor who really cared for her. I am glad Lynnette leaned on God to get her through. I know I am thankful that God was there for me. Miracles. So many people hope for them. We had a lot of people praying for us (and who continue to do so! thank you!) and I know many prayed for a miracle for us. This is actually one thing I never did pray for. I never asked God to heal Carleigh. I only asked Him to let her be born alive so I could spend some time with her. He answered my prayer, but He told me no. I wasn't angry at Him. God could've allowed Carleigh to be born alive but He didn't. God obviously knew that more good could be achieved with her not being born alive. I can't possible begin to fathom all the reasons why but that's not my job. I am just to trust Him. Has God ever worked a miracle in your life or in the life of someone you know? I could really relate when Lynnette said she drew closer to her husband in carrying Samuel. It has been the same for Anthony and I too. God has made us stronger and drawn us closer to Him in a way we may have never been had we not been blessed with Carleigh. Anthony was always there with his loving arms during times I struggled with my emotions. How has difficult times affected your marriage? I can sympathize with Lynnette's fear of the unknown at the time. Lynnette's friend's words certainly ran true for me. "Lynnette, love that baby while you still have her. She is still alive in your womb. Nuture her and care for her. Sing to her. Love her." The farther along I got in my pregnancy with Carleigh the more I grew to love her. I cherished my time with her. This is how my pregnancy with Kyndra was different. I didn't cherish those little things as much. I mean, why should I? I wasn't expecting her to die. I wish I would've. It just made Carleigh's time with me that much sweeter and it strengthened our bond. What fears have you struggled with? My biggest fear with Carleigh was what she would look like. The pictures online of babies with anencephaly are not pretty ones. It can be downright scary. Luckily, through my anencephaly support group I was able to see our babies as they were meant to be. Loved and in the arms of their parents instead of on a table as a specimen. But even after seeing pictures of other babies, I still held some of that fear.....until I saw her. And then I wondered what they heck I was so scared of. She was beautiful. What I fear now is the chance of this happening to us again. I know that the chance is very small, especially with me being on high doses of folic acid, but I know it can happen. Then my mind wanders to the idea of my baby having some other fatal defect. 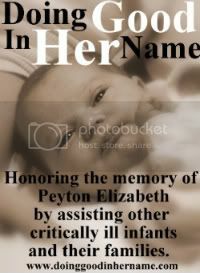 I just don't want to have to endure the loss of another child, whether it be early in pregnancy through later in life. However, I know that no matter what happens God will be there for us and He will get us through any trial we face. I loved Lynnette and Kyle's plan for their family. It's one that I would love to follow but I also know that Anthony wouldn't be to keen on the idea of just letting God bless us with as many children as He wants! If it was up to him, he would've stopped after we had Kyndra. I feel very strongly in my heart that God wants me to have more children. It's something I've prayed over many times. I would be quite happy to have a houseful of children. Anthony's biggest worry is over finances. Some days I'd really like to knock him upside the head and tell him to trust God already! God's plan and timing are perfect. Do you feel that God has a plan for your life? I knew that most likely Carleigh wouldn't come on her own so I wanted to carry her for as long as possible. I wanted to reach my due date. However, I made the decision at 37 weeks to go ahead with an induction because of her IUGR. I think if I could go back I would've waited instead of proceeding with the induction. I was anxious to meet my little girl but I could've also spent a few more weeks with her. But I made the decision I thought was best at the time and with the advice I had been given. I'm so happy that Lynnette and her family got that time with Samuel. It couldn't have been easy at times, especially seeing him having the seizures and slowing losing weight. We never want to see our children suffer. 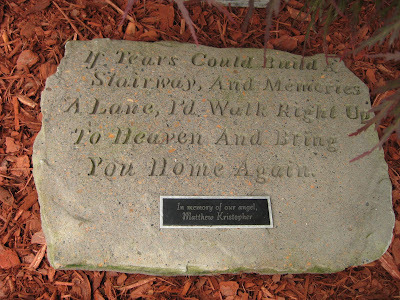 Lynnette's words, "Up to that day, the hardest thing I ever had to do was place my precious infant son in another's arms, knowing that while I was still alike, I would never hold him again. Samuel had gained heaven, but we were left here with empty arms. God would give us victory, and I would trust in his purposes for all of our pain. I would look forward to seein Samuel again," are words that I feel are very true. Handing Carleigh over to the funeral director was by far the hardest part of my whole journey. What has been the hardest moment of your life so far? Time to announce the winner of my Garden Giveaway! Sue has won the Burt's Bees Gardener's Tote. 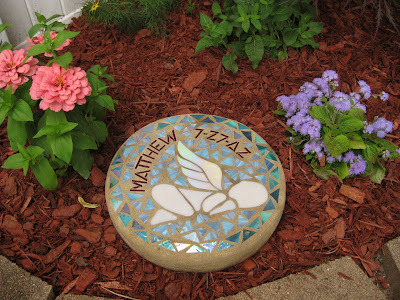 Sue shared with me pictures of her memorial garden for her son Matthew. I absolutely love the circle stone with the little angel on it. It's so unique! But I want to give an honorable mention to Debbie for the beautiful purple bush she shared with me. I wish I had this bush in my yard!! So I'm sending her a Burt's Bees tin pack. I will email both of you ladies to get your prizes out to you! Thank you so much for sharing your gardens with me!! This 5th week, we are sharing how we chose the names for our babies and any special meaning behind them. I love picking out baby names. I just think it is so much fun. 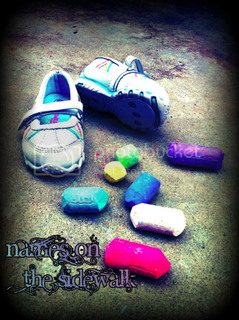 I started looking for names not long after I found out I was pregnant with Carleigh. What I do is I go through a whole bunch of names and write down ones I like. I then take my long list to Anthony and he gets rid of names he doesn't like. With what is left I narrow it down even more. When there's only a couple names I ask which one Anthony prefers. He usually doesn't care so then I end up picking the final name. This is how both Kyndra and Carleigh got their names. Kyndra's name means 'greatest champion' and her middle name Renee means 'reborn'. Jordan's name means 'flowing down' and his middle name Leigh means 'meadow'. Hannah's name means 'grace' and her middle name Nicole means 'victory of the people'. It's time to answer all the questions you had for me, but first I'd like to announce the winner of the Burt's Bees tin pack. 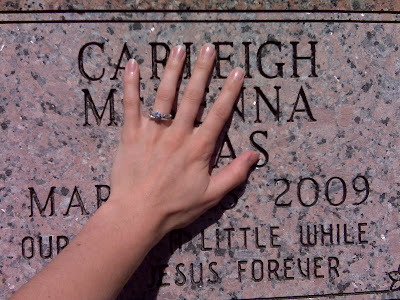 My question is where did you get Carleigh's headstone? And...how did you decide what to write on it? At Nate's cemetery, we are only allowed to do a ground marker (nothing raised). I have so much that I want to say on it...but I want it to be simple at the same time. It's the last thing that I will do for him and I want it to be just right. We ordered Carleigh's headstone through our funeral home. Our funeral home ordered it from some company in Georgia. We also had the choice of doing it through a monument company in town but just did it through the funeral home because it was easier for us. I knew that her name and birthdate would be on her stone. Those are a given. I wanted a nice inscription but I didn't know what I wanted so I searched on the Internet. I had a nice list of ones I liked and I kept narrowing it down until I finally picked "Ours for a little while, with Jesus forever". It seemed to fit best. I was wondering how you would handle the feeling of people seeming to forget Carleigh. For example: People will say to me, You look so great for having 3 kids! As if i have just 3. I have 4, you just can't see the oldest. How would you feel and handle this situation? As much as I would like it to not happen, I know that as time goes on Carleigh's memory will become dimmer for many people. She will always be known in my heart and in my mind and that is what matters most. I struggle sometimes on whether to include Carleigh when people ask me how many children I have. It can make people feel awkward. It's easiest when complete strangers ask you because you know you don't have to go into great detail with them. So far, every time I've been asked I have included Carleigh. I was wondering what your middle name is and if "McKenna" is a family name or just a name that you liked? My middle name is Lynn. A pretty common middle name. Carleigh's middle name McKenna is not a family name but just one that was on our list of middle names we liked. Would like to ask how you decided on Carleigh's name? I will get into this question a little more on this week's Walking With You but like her middle name, it was just one on the list of names that we liked. We just kept narrowing down our choices. Kyndra and my daughter Chloe are the same age (3 days difference). I could not imagine being pregnant & having to chase after Chloe too. Was it difficult on you to be pregnant while trying to take care of a one year old at the same time? I would have been so exhausted! 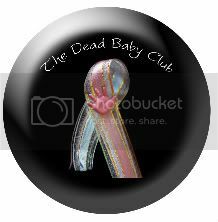 In reading your blog (and others that have gone through what you have) I have found new insight in the preciousness of the lives of babies yet to be born. From your first child to Carleigh how has your views changed? With my firsthand experience I've definitely been able to see how precious our babies' lives are. I guess I kinda took for granted the miraculousness of pregnancy itself. Sometimes things don't go right, whether it is with our own bodies or with our babies' bodies. We can't always control what happens but we do control how we choose to react to these situations. Carleigh has taught me to treasure things more and not take things for granted. My pregnancy with her was certainly more cherished than Kyndra's because I learned that each kick and each little hiccup is a miracle itself. How was it on Kyndra when Carleigh went to heaven? Do you think she knew something was going on? How did she react to meeting her little sister? How did Anthony's oldest daughter, Hannah, handle the news of Carleigh? I think by the end of my pregnancy Kyndra was starting to realize that something was going on with my tummy. She was 15 months when Carleigh was born. She did a funny imitation of me by trying to stick out her belly as far as she could. She mostly did it when we would take a bath together. So Kyndra didn't really grasp what was going on when Carleigh was born and had already left us. I do wonder though if she felt something was a little off because the days leading up to my induction she was super clingy and did not like for me to be out of her sight. Kyndra slept most of the time when we were with Carleigh. (She was born at 3:49 in the morning!) The times when she was awake and saw her she just kinda looked at her. I think she thought she was a baby doll. She poked at her a couple times and that was about it. We told Hannah about Carleigh just a few days after we found out. It was the night before we left on our family trip to Hawaii and we were staying in a hotel near the airport. Anthony told her and I could tell she was sad. The next day when we were on the shuttle bus she asked me what was wrong with her and I told her that her head and her brain didn't grow right and because of that Carleigh wouldn't be able to live once she was born. She seemed to accept that. Hannah wasn't present for Carleigh's birth or funeral. Does Kyndra remember that their was a baby and does she ask (in her own way) about her? Kyndra doesn't really know anything right now and doesn't ask at all. Occasionally I do show her photos of Carleigh and tell her that it is her sister. I'll continue to do that and I'll make sure that Kyndra knows all about Carleigh and how special she is. When I take her to the cemetery she just plays around in the grass and points at the flowers on the graves. My question is what feature of both of your girls did you love the most? The feature they share that I really love is their chubby cheeks. When we first saw Carleigh on her 3D ultrasound the first thing I noticed was those cheeks! I said they looked just like Kyndra's! I have been asked a couple times why I made that choice. I made the choice that was right for me. I really did not want to have a c-section and I knew very well that having one would increase Carleigh's chances of being born alive. But Carleigh also had a good chance of being born alive vaginally, even when I chose to have my water broke. It just wasn't meant to be for us. I knew that Carleigh would not be our last child and I did not want to have repeat c-sections. My doctor does not do VBACs and I have no intention of switching doctors. I wanted an easier recovery to be able to take care of Kyndra without having to rely on Anthony a whole lot. Also, I knew that I could have Carleigh on my chest immediately after she was born and I really wanted that. I wanted to be the first to hold her. How old is Coalee (your dog) and how and when did you get him? Coalee turned 9 years old June 23. He's getting to be an old man! :) Coalee was born in 2000 to my mom and dad's Rottweiler, Angel. He was actually not born alive and a friend of the family who has a lot of experience with breeding dogs revived him. Angel got mastitis not long after the pups were born and so we took over their care. We got up often to bottle feed them. Of the 4 pups that made it, we got rid of 2 of them. My sister kept one and I kept one. Coalee and Callie. When we all got married Coalee and Callie came to live with Anthony and me because we did not want to split them up. Callie passed away April 26, 2007 for reasons we still don't understand. We just came home from work and found her gone. I was a mess. I have always wondered how the news about Carleigh affected your marriage? If it brought you closer or ?? I would say our journey with Carleigh has made our marriage stronger. Anthony supported my decision to carry her to term and honestly even if he wouldn't have I still would have carried her. When we got our 'second opinion' from the Maternal Fetal Medicine Specialist Anthony really bought into the bullcrap that man was spewing and he wanted me to induce early. He didn't want me to go farther than 30 weeks. I told him no. I was carrying her all the way. I told him the real truth that the specialist seemed to ignore and it really helped to ease his fears and got him back on the same page as me. I wonder what you think your future looks like. Do you see more children? A Foundation for other families afflicted with the same disorder? I definitely see more children in my future. I love being pregnant and I love being a mommy. Anthony says we're only having one more but would like more than one. We are still at odds on this but I know we'll work it out. I would definitely like to do something to spread awareness and help out. Something is already in the works too. When we had the bike run for Carleigh, the owner of Whiskey Venue (who has spina bifida) asked us about doing a bike run for neural tube defects in the area to help raise awareness and money for the cause. So we are in the process of getting that around for the fall and I believe we will begin having that as an annual event. We know it will start off small but are hoping that if we do indeed continue it every year that it will grow into something bigger. I was wondering how much Kyndra knows about her sister? Or how much you think she knows? What did you tell her about Carleigh? Similar to the question above, Kyndra doesn't really know that much. While I was pregnant we told her all the time that mommy had a baby in her belly and it was her sister Carleigh. She couldn't really grasp it but near the end I think she knew something was different about me. (Must've been that big (small) belly! lol) As she gets older we definitely want her, and any other children we have, to know about their sister. You have admirable and addicting faith. Where and when did you find Jesus and how did it change your life? Do you feel closer to him now that you have gone through this? I have went to church since I was little and always loved going to Sunday School, children's church, VBS, and later being a part of our church's youth group. I was 12 years old when I accepted Jesus as my Saviour. It was at church camp during the summer during our worship service one evening. It felt so good! Throughout my life I've had times when I've wandered off the Lord's path for me (sometimes waaaay off) but He always welcomed my back into His loving arms. I was baptized when I was in college and my relationship has grown since then. I definitely feel so much closer to Him through this chapter in our lives. I was wondering about your faith and relationship with God. How have you developed that and how do you maintain that relationship? I grew up in the church but got away from it as an adult and would like to rebuild my relationship with God. You seem to be one of the most spiritual people I know. Thank you! It hasn't always been easy, believe me! I've made plenty of mistakes and continue to make them as a born again Christian. After Anthony and I got married I started focusing more on my relationship with God and praying for my husband. I honestly don't spend as much time reading my Bible and praying and just spending time with Him as I'd like to. Life tends to gets so busy and the moments get away from us, but I'm working on that and He's being patient with me! I keep a Bible beside my bed and I recently put there a small journal also. In the journal I have tucked in paper with prayer requests to pray for and I plan to start writing down prayer requests in this journal. Some nights I'm so tired that I don't even open it but I know that when it is in the book God knows those requests. Prayer is so vital in keeping a close relationship with God. I like to call my prayers 'conversations with God'. Often times I don't bow my head or fold my hands. I just talk to Him like you would talk to a person standing right in front of you. I have a lot of trust in God. I know He can do anything and I trust Him with every aspect of my life. It hasn't always been like that though. Carleigh has brought me tremendously closer to Him. One thing I have really wanted to start and have never done before is devotionals. Can you believe I've never done those before!? Right now I'm trying to find one I want to start. (I'd love suggestions!) So I am still a work in progress, but aren't we all? Last night I had a dream about Carleigh. It's my first dream ever of her. It was such a great dream that I feel blessed to have been given it. It felt so real. I don't remember how the dream started out but I was in the hospital in labor and soon to give birth to Carleigh. It wasn't a hard labor as I didn't seem to be in any kind of real discomfort. Anthony was there hanging out while I did my thing. The next part of the dream skipped over the delivery. In that next moment I was being handed my daughter. She was swaddled in a blanket. They had told me that she was already gone. Carleigh was so beautiful. She was even more beautiful in my dream. Her head was not open at all but totally closed. She had skin and lots of hair on top of her head. She still had anencephaly but you couldn't really tell. I couldn't believe at that moment she was gone because she looked so alive. The doctor came to exam Carleigh so he took her away for a little bit. When he came back he was smiling and he said that she was still alive. He handed her to me and I could see that she was! She had her eyes open and she was just looking at me. She moved her arms and legs around and made little newborn noises. My mom, dad, and sister were there and they each took turns holding her. Sometimes it looked like she was struggling a little bit and each time I would take her back-afraid that it was the end, but she held on. I was holding her and she was still alive when I woke up so I never got to see how the dream ended. Upon waking, I could still feel the abundant love from my dream. The first thing I thought when I woke up was "Wow, that was amazing." Amazing, indeed. Q & A and 2 giveaways! To top it all off I'm going to do a small giveaway for all those who participate. If you leave a question for me you are automatically entered to win a Burt's Bees Classic Tin Quartet. In this tin pack is Beeswax Lip Balm, Lemon Butter Cuticle Creme, Hand Salve, and Res-Q Ointment. Each tin is 0.3 oz (8.5 g). You will have all day today to leave a question in a comment and be entered. The giveaway will end at 11:59 pm EST. I will answer the questions and announce the winner on Thursday. But wait!! There's more!!! I have another giveaway for you! Remember Carleigh's Corner? 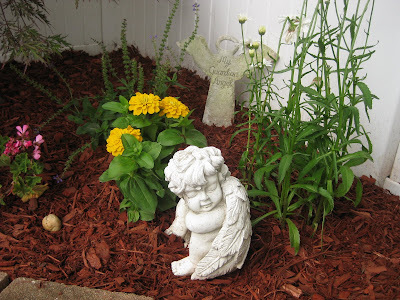 It's a special corner in our flower beds that honor Carleigh. I actually really enjoy gardening (pulling weeds not so much) but this year I did not plant any annuals. I have enjoyed the blooms on my perennials though. How many of you enjoy gardening too? 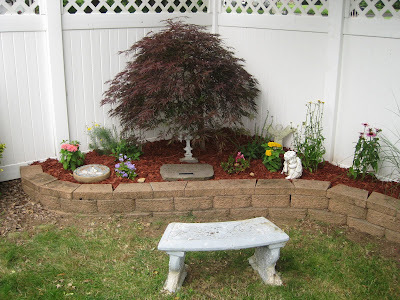 I'd love to see your gardens with your beautiful flowers and landscaping! Please email me pictures of your gardens at caring4carleigh@yahoo.com and you will be entered to win a Burt's Bees Gardening Tote. This tote includes Hand Salve, Lemon Butter Cuticle Creme, Res-Q Ointment, Herbal Insect Repellent, and Beeswax Lip Balm. Out of all the entries I receive I will pick the one I like the best. Entries can be submitted until Friday, July 17 at 8 pm EST. I will announce the winner that same evening and feature your garden on Carleigh's blog. I can't wait to answer your questions and see your beautiful gardens! I had my hopeful anticipation driving up and into the cemetery just like the times before but this time I wasn't disappointed. Pulling in I always look to this one black headstone because hers is almost directly behind it. Usually I see nothing but today I saw a stone sitting behind and I got so excited. I was so relieved to finally see something there and not just empty space. I pulled up and parked and got out for a closer look. This is what I have been waiting for all these months. A stone to mark my little girl's presence in the world. I sat down with my back against it and just rested there for a bit. Then I saw a pretty big spider on the ground and didn't want it crawling down my pants so I got up. I faced her stone and I dusted off the dirt. I wished I had a dust rag at that moment to clean it better. I traced the letters with my fingers. I rested my hand over her name. This is it, baby girl. This was the final step. The one last physical thing I could do for you. I called Anthony and told him the stone was up and he asked if I was coming home soon. I guess it was time for me to go home. So I got up and walked back to the van but then I stopped. I turned around and went back and I left a kiss on her stone for her. That's the closest I can come to kissing her now. Then I walked away with a single tear in my eye, but glancing back often. I drove home thankful and blessed. I blasted Born Again by Third Day the whole ride and sang quite loudly. I'm so glad that I have the hope of seeing my daughter again. This week on the MckLinky blog hop we are sharing '3 things you didn't about know me', but for Carleigh's blog I'd like to share 3 things you may not know about her. 1) She had such little ears but they were different from each other. They didn't match at all. It was like they belonged to two different people yet they were uniquely hers. 2) Her pinky fingers were a little crooked. It is a trait in Anthony's family that his brother and him share. They've passed it down to their children and Carleigh was no exception! 3) She had more hair on her head than Kyndra had when she was born. Really! She had quite a bit of hair and it had a blondish tint to it. So I think she would've had blonde hair like her sister. When Lynnette and Kyle were married in 1988 I was 5 years old. A long way from ever thinking about marriage but I can certainly relate to how their marriage started out. They were in love but lived mostly for themselves. When Anthony and I got married we both attended church together but we really didn't have a close relationship with God. A good way to put it is that we were going through the motions. We were more worried about paying off our bills and having nice things. If you are married, what was your marriage like in the beginning? We knew we'd have children but we waited to have some time to enjoy our marriage and for Anthony to get closer to finishing school. I decided over Christmas 2006 that I no longer wanted to be on birth control pills so I quit taking them. I remember telling Anthony that his Christmas present to me would be a baby. He wasn't all that pleased that I had decided this when he wasn't quite done with school but he went along with it. We started trying right away and I finally got pregnant in April 2007. When did you first decide you wanted to have children? Was it planned or unplanned? Like Lynnette, I never expected to feel what I felt toward my unborn child. Pure love. I worried for months praying my baby would stay safe inside of me. The feelings of first kicks is so incredible. What feelings did you have for your child when you first found out you were pregnant? I think it is so awesome that Lynnette and Kyle made the sacrifice so that Lynnette could stay home. I think being a stay-at-home mom is a wonderful thing. In all honesty, it's not something I think I could do because I love my job. My ideal would be just to work part-time but I don't mind working full-time. At some point in all our lives we search for something more. Most of us know about God but how many of us have a real relationship with Him? It took conceiving a child for Lynnette and Kyle to start to search for that something more. At what point in your life did you start searching for God? I grew up in the church and was actually saved when I was 12 years old at church camp. I was baptized when I was in college. But I never really had that close and personal relationship. Sure, I prayed and I occasionally read my bible. I went to church. I did just enough to call myself a Christian. I sinned many times and I came crawling back to God only to go about my life just lukewarm. It wasn't until after Kyndra was born in January 2008 that I really started to seek Him. My journey with Carleigh has brought me even closer to God. I do not know how I could function in this life now without Him. And I've also seen God working in Anthony's life too over the years. I remember when we were first married he mostly went to church out of obligation. Even though I myself needed a lot of work, I prayed for God to work in his life. It didn't happen over night, but slowly I saw the changes. For example, every time we got in the car he would listen to this one secular station with some not so nice music and I would change the channel to KLOVE. I didn't always win the radio battle but over time the music spoke to him and now the only station we listen to is KLOVE. And he practically knows all the songs! Praise God! I am so amazed at how God quickly provided a place to live for Lynnette and Kyle. God knows our needs and will certainly not let us go without. Has there been a time in your life that God provided? I can think of one specific time not long after we were married and we had so many bills. At one point it looked like we wouldn't be able to pay them all and so I asked God to provide. Provide He did! Not long after that we got a $500 check in the mail for a scholarship reimbursement for my schooling. God's timing is perfect. I hope everyone's weekend has been good. I've taken several much needed naps and would love to sneak another one in. I've been feeling quite tired lately. I just wanted to take the time and let everyone how I have been doing lately and let you know of some things to look out for in the near future. Aside from being tired, I have been doing well. I've been missing Carleigh like crazy lately and I've had some emotional times. I am ok. It's not sad for me, really. I'm actually quite happy and a joy radiates my soul when I think of my daughter. But I miss her and as I see babies around her age I miss her even more because I wonder what she would look like now and what cute things she would be doing. I'm so blessed to have Kyndra to love on. It really would be much more difficult without her. Speaking of Kyndra, I find myself not wanting to be apart from her for long when it's not necessary. Today in church she was starting to act up so Anthony took her to the nursery. When he left with her I felt so strange because there was nothing in my arms. It felt wrong and my eyes started to swell with tears. I almost got up and left but Anthony came back and he had her blanket and bunny with her. I took them from him and held them the rest of the service. I felt better just having something in my arms to hold. Hopefully I can learn to be a little less anxious with this. Carleigh's headstone is still not up but we should be getting a call soon from Brian telling us it is. I have a giveaway I plan on doing sometime this week so keep your eyes open for that. Are there any BlogFrog users out there? I have one of their community widgets on my right sidebar. Well, I am now one of their superusers (aka community leaders). :) I'll be trying out new tools and widgets for them and giving them feedback. In trying out these things, I'll be testing them on my blog! 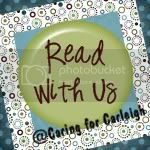 I've started some discussions in my Caring for Carleigh community on the BlogFrog. Stop by and check it out because I'd love to hear from you! You may have noticed some changes in the look of Carleigh's blog. Christina added a navigation bar for me and did a great job! (She's designing blogs again if you want a new look!) The navigation bar frees up some space on my sidebars. The only link still not working yet is Carleigh's Story. I'm still in the process of getting all of her story down and it may take me the whole week to do it. Rest assured I will get it done! Remember my Mother's Day giveaways? (Click here and here.) 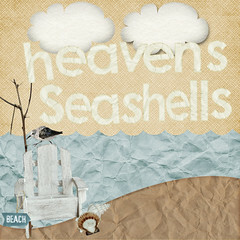 I wanted to share with you the beautiful designs that Sue from My Forever Child created for the winners. "I absolutely love my necklace and wear it almost everyday! It is beautiful and more than I even expected! I am so grateful for the chance to win and think it is awesome that Holly and Sue have paired for the giveaways! We are going through a rough time, expecting our little girl Jillian in 2 weeks, who was diagnosed with Anencephaly. So something as simple as winning a drawing put a big smile on my face during this rough time! The necklace is something I will cherish for years to come! Thank you both so much!!" Perfect for including all of your children’s names in one pendant. 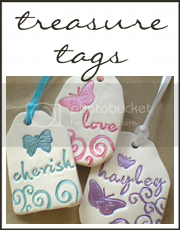 A rectangular tag is engraved with your desired inscription up to 3 lines, 12 characters each line. 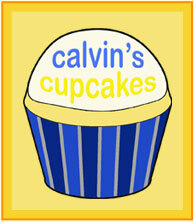 You can also have a heart or star shaped design added in. 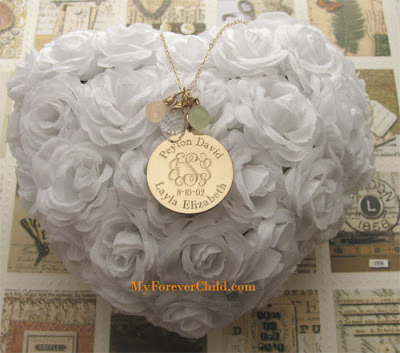 This Personalized Tag necklace is available in Sterling Silver or 14K Gold Filled. Comes with a necklace chain. "It is beautiful!! She did a great job incorporating all four of our family members. She apologized for the delay, but to be honest, I had no idea how long it would take and was surprised when it arrived. I hadn't forgotten but it had been awhile and so the package in the mail was a delight. I want to thank both you and Sue again for offering this giveaway and for the beautiful work you do for those who have lost loved ones!" A large 1.25" round pendant is engraved in a circular design in Roman Font with the names of your children (or other message). The center Script Monogram includes the parent's initials. The date below the monogram is the wedding date. You can also enter an optional message on the back of the pendant. This pendant is available in Sterling Silver or 14K Gold Filled. Comes with a necklace chain. Thank you Sue for your great work and generosity! This 4th week, we are sharing about saying goodbye and experiencing the memorial service or funeral if applicable. By the time Carleigh made her arrival, every detail of the funeral arrangements had been planned. We had 4 months to prepare. (Click here, here, here, and here. )The only thing we did afterward was go over the order of the service with our pastor. Carleigh was born March 28 and we had her first visitation on the evening of April 3 and a visitation the morning before her service on April 4. We had lots of family and friends travel to come see us and Carleigh. I was glad to see so many had made the trip. It really meant a lot to me. I got to the funeral home that Friday evening long before we expected anybody to arrive. I wanted to spend as much time with Carleigh as possible. When I got there I realized I had forgotten Carleigh's fuzzy pink blanket and I was upset. I needed her fuzzy pink blanket to hold her in. My dad went back to our house and got it for me. I felt so much better once she was wrapped in it. Slowly people came...family, friends, coworkers, church members, neighbors. I held Carleigh the entire visitation except for the few times Anthony held her and the times my cousins Amber and Jayme held her. There were tears, both from me and from others, but for the most part the atmosphere was light. My mood was generally good because I was so happy to see my little girl again and the sorrow of the moment rarely broke through my joy. Leaving her there was a little difficult. Saturday I got around early again so that I could be at the church to have some time with her before everyone arrived. I set up a table with some of her keepsakes to share with everyone. Once my arms were empty of these things I went straight to my daughter and picked her up. She never left my arms until I had to put her in the casket after the service. The service was very good. (Ashley took pics for us and we videotaped it.) We had a few family members share some things and we watched a slideshow of Carleigh. I was much teary-eyed throughout the service. Afterward family and friends filed through to where we were and said their condolences and left the sanctuary. Soon it was just our extended family. After they had said their goodbyes to Carleigh, Anthony and I walked our daughter to her casket and spent some last moments with her. I didn't want to put her in there. I wanted to walk out of that church and take her with me. But I knew what I wanted wasn't feasible. So I laid our daughter in her lavender and white casket. I kissed her over and over and told her I loved her. Anthony did the same. I covered her up with her blanket and gave her more kisses. Then I had to close the casket. I managed to do it and then I turned around and walked away. Anthony and I walked right out of the sanctuary and out of the church. We waited by the hearse to wait for her. My brother-in-laws carried her out and put her in the back. Then we got in the limo and headed out to the cemetery. Kyndra kept things from getting too emotional on the ride there. She was smiling and having fun. Oblivious to all the pain and sorrow. At the cemetery we gathered around her plot and our pastor said a few words. Then everybody just stood around. Nobody moved. We all just stared at her little casket. It was quiet except for the 2 horses beside the cemetery that came to the fence to watch us. People started coming up and hugging us one by one. After a while sitting there I finally stood up and told Anthony it was time. We walked back to the limo and went back to our church for a meal. I guess what I would tell parents is don't be afraid to speak up about your wishes and desires. Don't worry if people don't agree with them. At that time, it only matters what you want. I'm sure some people question why I would hold my daughter the entire time. I loved it. I knew I would never get those moments back and I wanted to spend them with her in my arms. Before long they would be empty forever. Do you have your book yet?